Manned by factory trained engineers our service vehicles are specifically designed to carry out Tail Lift and Shutter Door roadside breakdowns quickly and efficiently. Our 24 Hour Mobile Breakdown Service for Tail Lifts & Shutter Doors covers the following areas: Hull, Beverley, York, Bridlington, Scarborough, Scunthorpe, Grimsby, Lincoln, Immingham, Harrogate, Thirsk, Thorne, Skegness, Newark, Goole, Selby, Whitby, Nottingham, Derby, Mansfield, Worksop, Retford, Newark, Grantham, Melton Mowbray, Loughborough, Burton upon Trent, Chesterfield, Sheffield, Rotherham, Doncaster and surrounding areas. We also work closely with over 50 Tail Lift repairers throughout the UK which enables us to offer our customers full national 24hr breakdown cover. Additionally, we have agreed inter-agent rates so that you pay the same charges throughout the entire country. All Tail Lift repairs are carried out by manufacturer trained and certified specialist Tail Lift engineers and can be carried out on-site or at our main purpose built workshops in Hull. Our fleet of well stocked and fully equipped service vans are manned by factory trained engineers, who have a vast wealth of experience within the tail lift industry. As a result, we are able to carry out the vast majority of repairs on-site. We offer a same day or next day service for all repair work and to further minimise down time, we have direct immediate access to the UK’s largest stock of genuine Tail Lift parts. Not only do we provide a market leading repair service for the UK’s largest commercial fleet operators, we also offer a personalised service to many small organisations and private individuals who own and operate mobility Tail Lifts. As Tail Lift specialists with over 28 years’ experience, our repairs represent real 'value for money' as we are more able to correctly diagnose faults quickly and carry out the required repairs efficiently. For major repairs, severe accident damage and large rebuilds we operate fully equipped and purpose built Tail Lift repair workshops in Hull. As main agents for all of the leading Tail Lift manufacturers we are able to carry out warranty repairs on all makes of Tail Lifts. Our engineers are manufacturer trained and certified to carry out all of your 6-monthly Tail Lift Statutory Thorough Examination requirements. We provide a comprehensive service for LOLER inspections to businesses and private individuals and these can be carried out on-site for your convenience or alternatively at our main Repair Depot in Hull. Please note that it is a requirement of current legislation for Tail Lifts to be regularly examined at a frequency of no more than 6 months apart. 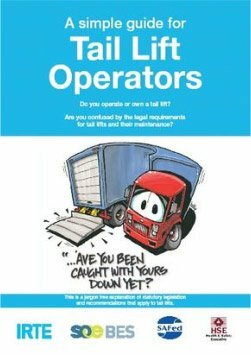 Further information regarding LOLER and your legal obligations as a Tail Lift operator is available from the HSE approved Tail Lift Guide. A free copy of this guide can be downloaded from the link on the right. If you are a local charity, care home, community transport organisation or private individual that uses a Tail Lift for mobility use, we offer a broad range of services specifically for you. From routine LOLER examinations, servicing and repairs through to the supply and fit of new Tail Lifts, we offer a cost effective personalised service. We are able to carry out the vast majority of work on your site, at your home or alternatively at our purpose built Tail Lift workshops in Hull. As main agents for all of the major Tail Lift manufacturers, our fleet of friendly mobile Tail Lift engineers are trained on the full range of Mobility Tail Lifts and only fit genuine parts for complete peace of mind. All Shutter repairs are carried out by well-trained engineers with a wealth of experience. We only use genuine parts and can carry out repairs on-site or at our large workshops in Hull. From hinges and rollers to cables and counterbalance springs, our experienced engineers can carry out the vast majority of shutter repairs on-site. We offer an on-site Shutter Door repair service throughout Yorkshire, Lincolnshire & Nottinghamshire. We specialise in repairing badly damaged Shutter Doors and carry a large stock of genuine parts including replacement panels, laths, locks & shutter tracks. We have over 28 years’ experience of repairing all types of shutter doors fitted to a range of vehicles from 3.5ton GVW through to the large insulated shutters found on HGV’s. We can supply and fit any shutter door to suit your specific requirements. Does your Shutter require repairs or replacement? Humberside Tail Lifts was formed in 1990 and grew rapidly to become one of the UK's leading Tail Lift and Shutter Door Specialists. We run a large fleet of fully equipped and well stocked Service Vans with operations in Hull, Nottingham, Lincoln & Doncaster and offer a reliable 24hr breakdown and mobile repair service throughout Yorkshire, Nottinghamshire & Lincolnshire. We understand the pressures our customers often face when a vehicle is off the road. Therefore our friendly service team are dedicated to getting any breakdowns back on the road fast and can minimise any inconvenience caused by essential repairs & maintenance. Additionally, we claim to hold the largest stock of genuine Tail Lift & Shutter parts within the industry which further enhances the service we provide and our response times. Our commitment has always been to provide all of our customers with market leading levels of service and customer care. Supported by over 50 tail lift repairers throughout the UK with agreed inter-Agent rates, we can provide efficient nationwide breakdown coverage for your complete peace of mind. We can also offer expert impartial advice on the best products that most suit your needs along with the supply and fitting of all makes of tail lifts and shutter doors. Humberside Tail Lifts is a subsidiary of Motus Holdings (UK) Ltd., itself part of Motus Holdings Limited, a diversified (non-manufacturing) South African company centred on the automotive sector and founded initially as a single car dealership in 1948. Today, it is a business listed on the Johannesburg Stock Exchange, turning over close to £4.5 billion and employing some 18,300 people across its operations in South Africa, the UK and Australia. Motus Holdings (UK) Ltd. operates the UK’s largest independent commercial vehicle dealer group and, with its passenger vehicle interests included, ranks inside the Top 15 of all UK automotive dealer groups. The company has annual revenues of over £1 billion and employs almost 3000 people across its operations. Within the MOTUS group, we also have several Ford car and van dealerships for new, used and Ford privilege customers. What ever your problem, we have the solution. Simply fill out the form below and a member of our team will get back to you as soon as they're available.